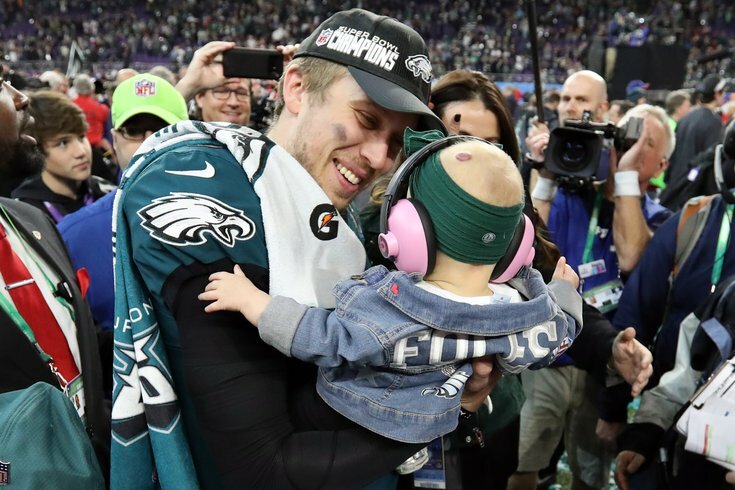 Philadelphia Eagles quarterback – and Super Bowl LII MVP – Nick Foles hold his daughter, Lily. Nick Foles for a Cleveland Browns second round pick? That was the rumor, reported by various NFL sources — which went on to say the Super Bowl MVP turned down the opportunity to go to Cleveland electing instead to stay in Philadelphia. When Foles addressed the media for the first time since hoisting his trophies in Minnesota, he denied the rumor in no uncertain terms. Which Eagles could still be traded this offseason? WTS: How much better did the Eagles get this offseason? "The first time I heard about it was when I got text messages asking me if it was true," Foles said Tuesday during OTAs in South Philly. "I am excited to be here. We restructured my deal so I would be here and it provides protection for me and provides protection for the team — both of us want me to be here. I love the City of Philadelphia. My wife and I decided to come back here. I am grateful to be here and the team embraced me being back here." Even as Carson Wentz continues to rehab from the torn ACL (in Week 14) that robbed him of the chance to play in Super Bowl LII — taking individual drills on the field with teammates and ferociously working to return for Week 1 — the Eagles wanted to take out an insurance policy on Wentz. Which is why Foles has a new extension with a mutual option for 2019 and $2 million in incentives if he does start next season. If the trade indeed was a possibility, Foles was not consulted — as reports suggest. The team could very well still be interested in moving him — at least that's what rumors suggest. As does conventional football logic and a prediction of how Howie Roseman may behave should Wentz return healthy. But Foles claims none of it is true. "There wasn’t any discussion on the trades," Foles said. "Howie [Roseman] said what he wanted from me, and I said if there was some point he wanted to sit down and have a discussion we would talk about it, but it never came to be." "I never turned down anything. We never talked about anything that wasn’t a true statement. At the end of the day, I am happy to be here. I am not the GM of this team. Y'all are asking the question because y'all are all curious. And I am answering: It is done." For most quarterbacks fresh off a Super Bowl MVP, the prospect of being a backup again might be unappealing. But Foles has been on a unique NFL journey. He is on his second stint in the city that drafted him, after a failed tenure with the Rams, a mulled retirement and backup role in Kansas City. Foles has been through a lot. In Philly he was happy to be back somewhere familiar. And eventually happy to be on the field leading a playoff team. And, of course, turned himself into a city legend and Super Bowl MVP by besting Tom Brady and the Patriots in the most dramatic of fashions. Last year at this time Foles and his wife welcomed his first born daughter into the world. And ever since, he's been uncompromising in his optimism and happiness. "I have a lot of fun going to work," he said. "I have a lot of joy. When I am done here, I get to go home to my family. My daughter is about to be 1-year-old and I get to enjoy this time in my family." So go ahead NFL teams, give the Eagles your best offer for Foles. Because that's what it will take to get the content Super Bowl champion to agree leave the life he loves.